Dermocosmetics CHRISTINA and HOLYLAND are the corrective cosmetics, which addresses various aesthetic skin problems such as acne, post-acne, dry and oily seborrhea, vascular defects, hyperpigmentation, irritated and sensitive skin, premature skin aging, wrinkles. CHRISTINA has 10 professional lines and over 200 products for home care. Due to the high efficiency of products used by some series and in dermatological clinics. Beauty products are made from high quality ingredients, free of allergens, ingredients are carefully tested. They contain natural preservatives. Biolage - the right way to pleasant and healthy hair. Try it in the salon UNO DUE! The best way to take care of your hair - using the power of nature combined with the achievements of modern beauty industry. 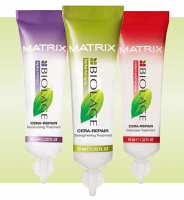 Both of these features combines the production of brand Biolage by Matrix. We can just let to try cosmetics, but also we can buy for home use in the beauty salon UNO DUE. 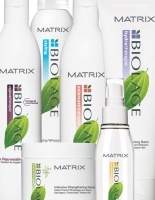 Biolage - it is a professional hair care and at the same time, these products contain natural ingredients inside.